If you are looking for the best waterproof Fitbit for swimming you may notice that most Fitbit tracker are only splash proof, and is true that a lot of readers claim that their Fitbit can get inside the sink with no problem but that not the same as waterproof. The Fitbit range is getting wider every year but if well they improved a lot in the fitness department they didn’t get new models that can be submerged in the pool to track your laps. Since 2016 the only Fitbit able to be underwater and good enough to be on during swimming was the Fitbit Flex 2, but it wasn’t the most complete tracker when it comes to fitness. But the real improvement appear last year when Fitbit launch his 2 new Smartwatches that came to amazed the market with 2 of the best trackers from the company, the Ionic and the Versa that are not only swim proof but they also feature a lot of new fitness tracking abilities as well smart features that can change the way that you wear a smartwatch for good. 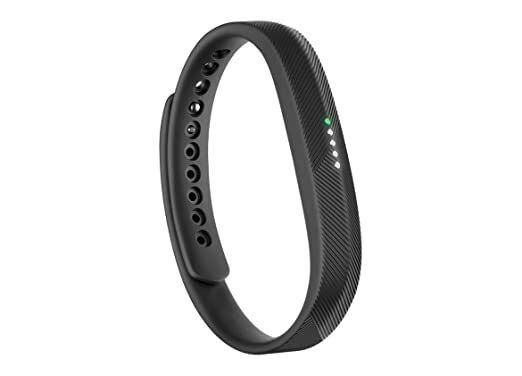 The Fitbit Flex 2, the Ionic and Versa can all be used for swimming and all of them can be submerged up to 50 meters (5 atm), but each of them has differences when it comes to features, design, and prices. The Flex 2 is the cheapest of the bunch and the Ionic is the most full-featured, but the biggest contrast comes in terms of tracking abilities and price. So we give you a review of each tracker so you know which one is the best Fitbit to swim with depending on your needs. The first tracker from the Fitbit family to ever be swim proof, and is today one of the cheapest trackers on the Fitbit range, as well in the market, and having in mind that is able to get underwater not only from swimming but also to shower, so you can track 24/7 your fitness and health, is today one of the bets trackers without a doubt. The Flex 2 can track your steps, distance, calories, active minutes and hourly activity. Is able to track your runs and workouts such as elliptical sessions, and aerobic workouts in addition to swims automatically, thanks to the SmartTrack feature that is also available on other modern Fitbits such as the Charge 2 and HR, as well the Blaze. You can also get notifications from your phone at a glance on your wrist, such as phone calls and texts, but since it can’t display the text you can’t read the messages. The Flex 2 appear to the market as an upgrade from the original Flex but the 2 version is 30 percent smaller and has the ability to be removed and placed in different types of wearable accessories. To check stats you don’t have a display so you will have to rely on a series of LED lights that will give you the data. Then you need to check the app to understand what was going on. So it’s not the best way to understand data or receive notifications but is without a doubt the cheapest option when it comes to Fitbit for swimming. The Ionic appear to the market last year with the promise of revolutionizing the smartwatch world and they deliver! The idea was to get into the smartwatch market with the most high-end fitness tracking features and start to create a smart ecosystem for apps such as the AppStore, instead, they create de Fitbit gallery where you can find the latest apps that are available to use with the Ionic. Although is going to take some time to get at the level that Apple is when it comes to apps and developers, Fitbit tried its best and with the help of the Pebble team they create a smartwatch that can deliver smart and fitness quality, and is the first tracker that did an impact on the market having the first smartwatch with high-end features that is able to be used with both Android and iPhone users. When it comes to swimming the Ionic is the best performer not only from Fitbit but probably the Best ever, with high end features such as built-in GPS, heart rate monitor, it can track at the highest level each of your laps and can auto recognize your strokes so you don’t need to program anything just get into the pool and the tracker will start to record all your data with accuracy. On the Smart side the Ionic is able to process payments, so you can pay right from your wrist using credit and debit card such as American Express Visa or Mastercard. 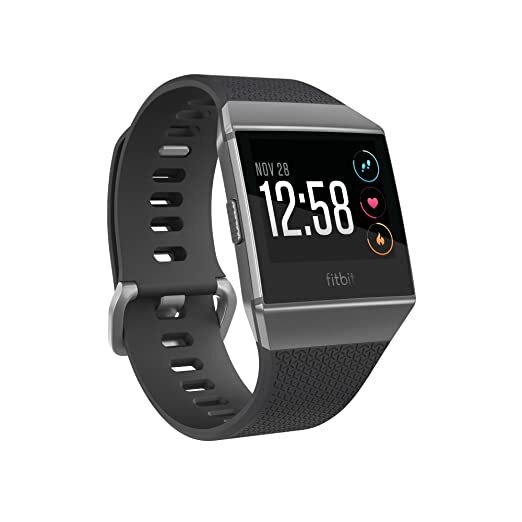 It also comes with the cool Fitbit coach that will give you exercises and routines and will learn from your progress and take you to the next level. You can check our Full review for more information. 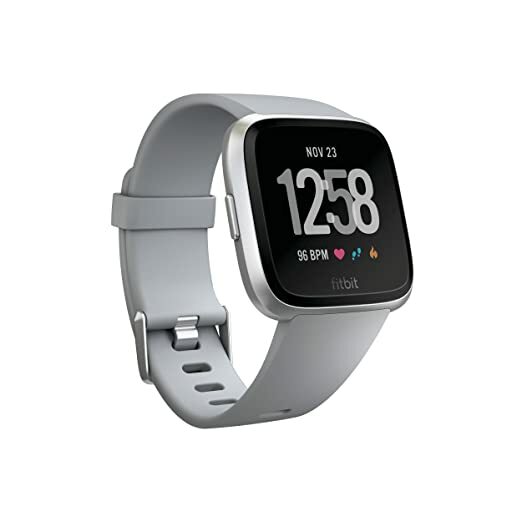 So last but not least is the newest model from Fitbit, the Versa, that appear into the market to address the biggest criticism that the Ionic had, its square design that wasn’t a hit with everybody. With a design similar to the Apple Watch and more rounded to win those people that didn’t like the Ionic, the Versa is one of the best looking Fitbits yet. The second problem that the Versa was addressing was in terms of Price, is true that compared with other smartwatches the Ionic was cheaper the $300 mark is something that didn’t click with a lot of people having in mind that the other Fitbit models don’t go further than $200. The Versa is priced at $200, so is not the cheapest model but comparing with the Smartwatch features that are also available on this tracker such as the ability to pay from your wrist or the Fitbit coach the price is the cheapest not only for Fitbit but for the smartwatch market. This tracker is not only smart but comes with all the High-end fitness features that are available on the Ionic except the built-in GPS, this is the reason for the price difference basically. A cool feature that is available on this smartwatch that is the first for any tracker, is the ability to control women’s health, so it can track women’s cycles and learn from the data and predict not only the time of the month for it but also can predict a headache or other symptoms. When it comes to swimming the Versa can also automatically track your laps and strokes so you can get accurate data, although the lack of GPS can be a downside when it comes to accuracy. So the Versa is on the middle from the cheap Flex 2 that is not as full-featured as the Ionic but at the same time is cheaper than any smartwatch on the market.